Science Cafe's help to promote scientific literacy by encouraging relaxed, open conversations among scientists and nonscientists of all ages. Thursday, February 7, 7:00-8:30 p.m. 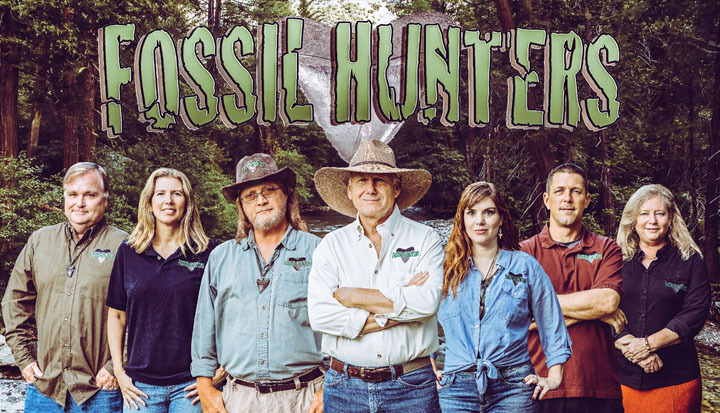 Explore Florida geology and paleontology with the cast of the Fossil Hunters television series, which follows the adventures of a group of amateur paleontologists and friends as they travel with their families to amazing fossil sites. The world’s first and only fossil hunting television series, Fossil Hunters, highlights the cast’s fossil collections and past and present excavations as well as world-class discoveries. In this informal conversation, with slides, you’ll learn of their travels to various fossil sites and museums, exploring our state’s geological past. Thursday, February 21, 7:00-8:30 p.m. 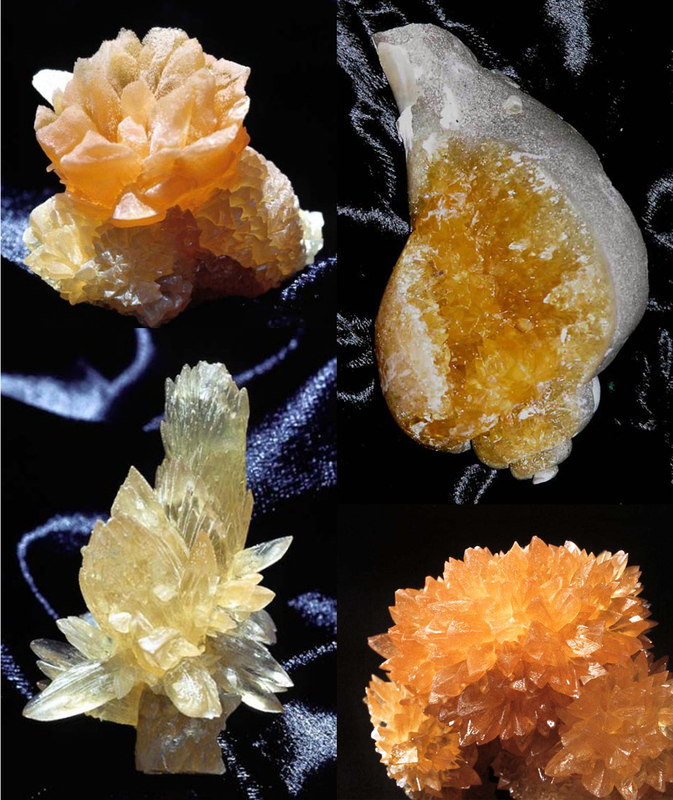 Celebrate the opening of our Spring 2019 exhibit Florida Calcite, by joining three of the state’s renowned geologists to discuss Florida calcite, and the geological processes which have created our most common, and most beautiful mineral. Tom Scott, Assistant State Geologist Emeritus, and Harley Means, currently the Assistant State Geologic, both of the Florida Geological Survey, will be joined by Sam Upchurch, Vice President and Senior Principal Geologist (Retired), SDII Global Corporation, and former professor and chairman of the Geology Department, University of South Florida, to discuss their digs, finds, and decades of research. Thursday, March 14, 7:00-8:30 p.m.
Environmental educator and photographer, Dustin Angell of Archbold Research Station will give an overview of the developing conservation photography movement, share his portraits and documentary work of Florida ecologists, and offer tips on how others can participate in the movement. Participants will learn about the historical relationship between photography and conservation in the United States and the difference between nature photography and conservation photography. Angell lives and works in the headwaters of Florida's Everglades. As the Education Coordinator at Archbold Biological Station in Venus, FL, he builds community relationships and interprets ecological research for audience of all ages. Dustin holds a Bachelors of Fine Arts from Alfred University. As an artist, he uses photography to document the science and conservation challenges of the region and the people trying to solve them. His photo essay on Florida Grasshopper Sparrows was published in the Spring 2017 issue of the Cornell Lab of Ornithology's Living Bird Magazine. 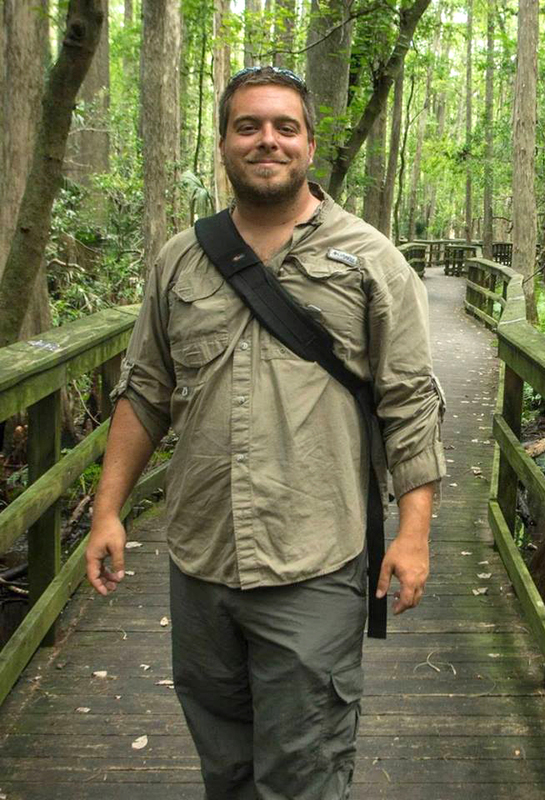 Dustin is the Past President of the League of Environmental Educators in Florida (LEEF) and the recipient of the 2015 Outstanding Educator Award from the Florida Chapter of the Wildlife Society. Thursday, April 25, 7:00-8:30 p.m. 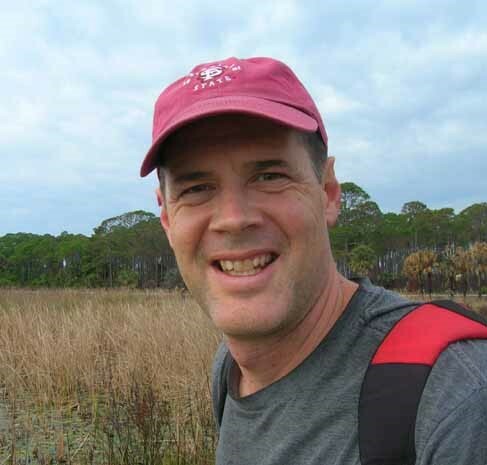 The Gillespie Museum’s April Science Café will feature Stetson environmental geologist Ben Tanner discussing some of his recent coastal Florida research. Florida’s karst systems are responding to a number of stressors including climate change, declining water tables, and anthropogenic nutrient inputs. This talk will describe how organic deposits can be used to infer the response of these environments to past stressors and will explore how this knowledge can be used to help predict future environmental changes in these systems. Benjamin Tanner is an Assistant Professor of Environmental Science and Studies at Stetson and is the Focus Area Leader for Climate Adaptation in the Institute for Water and Environmental Resilience. He is a field-oriented environmental geoscientist and outdoor enthusiast who seeks to inspire the next generation to appreciate and preserve our natural areas through the hands-on study of earth places and materials. 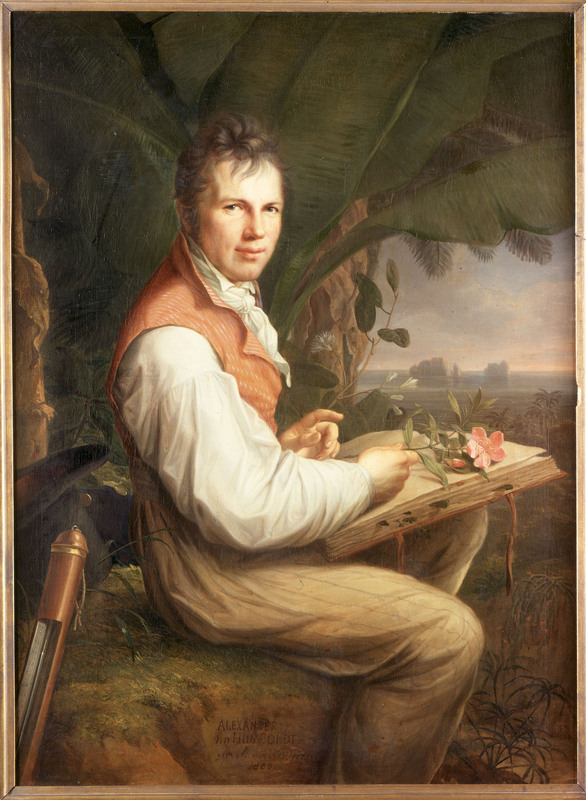 His education and background--beginning with an anthropology degree (Florida State University), then continuing into Quaternary and climate studies (University of Maine), and culminating in geology (University of Tennessee) -- relate to how humans interact with the environment. He currently uses the tools of geology to study wetlands and how they respond to climate and environmental change. He also uses wetland deposits to elucidate past climate changes, including temperature, precipitation and sea level changes. He has involved undergraduate students in all aspects of his research and has mentored over 30 undergraduates in research experiences outside of class. Many of these experiences have led to co-authored conference presentations and a journal article publication with the students. For its first Science Café of this academic year, the Gillespie Museum, Stetson University, will host Jonathan D. Arthur, Ph.D., P.G., the State Geologist of Florida and Director of the Florida Geological Survey, a division of the Florida Department of Environmental Protection. This event is scheduled for Thursday evening, September 27, from 7:00 – 8:30 pm. 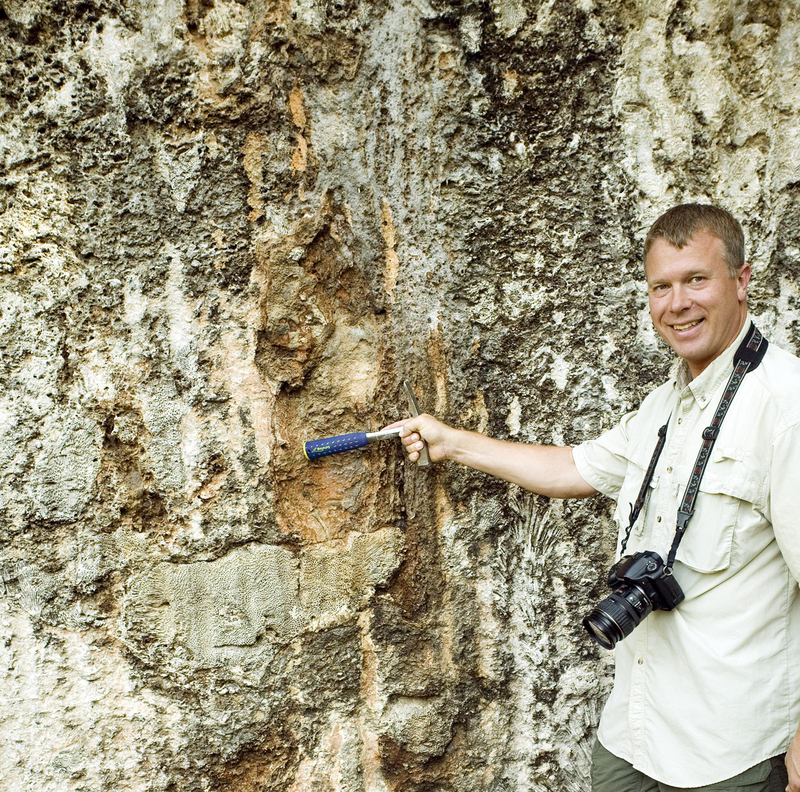 A graduate of Florida State University, Jon Arthur is currently a Fellow of the Geological Society of America, an ex-officio member of the Florida Board of Professional Geologists, and a member of the Executive Committee of American Geosciences Institute. He has received the John T. Galey, Sr. Memorial Public Service Award from the American Institute of Professional Geologists and has dedicated himself to public service by giving congressional briefings and testimony, keynotes, international workshops. Dr. Arthur’s research interests include hydrogeochemistry and aquifer vulnerability, with a special focus geoscience policy and advocacy. He is eager to engage the public in geoscience, and to ensure that geoscience is applied to address societal and environmental issues. This semester, Falk serves as a visiting professor in Stetson University’s Department of Environmental Science and Studies. At his home university, the Institute of Geography, Freiburg, Germany, he is a professor of physical geography. His research interests focus on the intermingled social, political and ecological dimensions of land use, climate and landcover change. As a specialist in education and as a professional geographer, he is also involved in pedagogical research and secondary teacher training. On Wednesday, January 24, at 7:00 pm, Stetson University’s Gillespie Museum will host Los Angeles-based artists Jessica Rath and Robert Hoehn for a Science Café conversation on "Bee Sensoria: Artists' Perspectives." 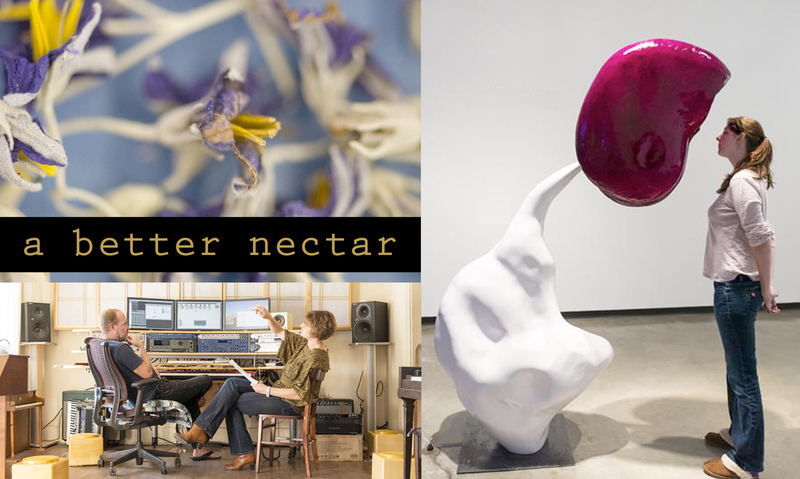 In association with a better nectar, an exhibition opening on January 26, and co-hosted by the Hand Art Center and Gillespie Museum at Stetson, this discussion will explore the role scientific observation and data played in creating their “artist perspective” on the sensory experience of bees. Rath and Hoehn researched bee foraging patterns and bee-to-flower communication at the Leonard Bee Lab (University of Nevada, Reno). Their research has translated into a “buzz pollinated,” seven-foot flower anther and a human-scaled bumblebee nest that emanates a six-part score and changes with a live NOAA weather feed. Jessica Rath teaches at Art Center College of Design, Pasadena, CA and received her B.A. from University of Missouri and her M.F.A. from California Institute of the Arts. Her most recent awards include Mid-Career Fellowships from California Community Foundation (2014) and the City of Los Angeles (2013, COLA). In 2012-13 her exhibit take me to the apple, based on genetic work at Cornell University Agricultural Research Station, garnered reviews in Art in America, Artforum, Los Angeles Times, Bon Appetit, and Smithsonian Magazine. Her work is included in Center for Art and Environment Archive Collections at the Nevada Museum of Art. 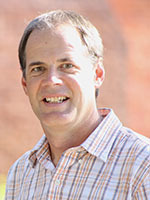 Composer and sound designer Robert Hoehn received his BFA in Electro-Acoustic Composition from California Institute of the Arts in 1994 with additional studies at the Center for Computer Research in Music and Acoustics at Stanford University and the Hartt School of Music at University of Hartford. Trained as a musician, composer and keyboardist, Hoehn creates music and sound for pictures and builds interactive electronic sound systems for galleries, and experimental mechanical acoustical sound sculptures, most often exhibited in art and music festivals. In 2014, Hoehn created Wind Sound Sanctuary with funding from Burning Man Arts, a 50-foot playable pipe organ, windmill-driven with custom Aeolian harps. The exhibition, a better nectar, is divided between the Hand Art Center (HAC) and the Gillespie Museum. At both locations, visitors are provided a human-scaled experience of a bee’s intimate sensorial journey from its underground nest to an audibly and visually pulsating world. The center piece at the HAC is “Resonant Nest,” a multi-sensory, human-scaled bumblebee nest that resonates human voice interpretations of bee communication composed by long-time collaborator Robert Hoehn. “Bee Purple” immersive light projections emulate bees’ spectrally shifted experience of the color wavelengths that attract them to floral patterns and nectar. On exhibit at the Gillespie is the seven-foot “Staminal Evolution,” a sculpture based on flowers that require “buzz pollination,” a process in which bees vibrate a certain frequency to open the flower and thus release its pollen. A research station at the Gillespie includes a gallery of digital images of Florida native pollinators, taken by Peter May, Ph.D. (Professor of Biology, Stetson); displays of native pollinating insects, assembled by Cynthia Bennington, Ph.D. (Professor of Biology, Stetson); and a seed library, from which visitors may “borrow” the seeds of native plants to sow at home. At the adjacent Rinker Environmental Learning Center, visitors may tour the Volusia Sandhill Ecosystem, an urban reforestation project, to view and monitor native pollinators in the landscape. November 16, 7:00 - 8:30 p.m.
"Florida is known for many things including beaches, Disney World, oranges and plentiful sunshine. But not many people appreciate the geology that makes our state unique. We don’t have mountains, canyons or much topography, but we do have a diversity of geologic features that are equally impressive." Florida’s surficial geologic units are comprised of limestone, dolostone, quartz sand and clay that reflect more than 40 million years of geologic history. In this conversation, Means will discuss Florida’s unique surficial geology and the processes that have shaped our state over millions of years. Guy H. (Harley) Means was born and raised in Tallahassee, Florida. He attended Florida State University where he received both a bachelor and master of science degree in geology. He is a licensed Professional Geologist and has been employed by the Florida Department of Environmental Protection, Office of the Florida Geological Survey (FGS), in Tallahassee for over twenty years. 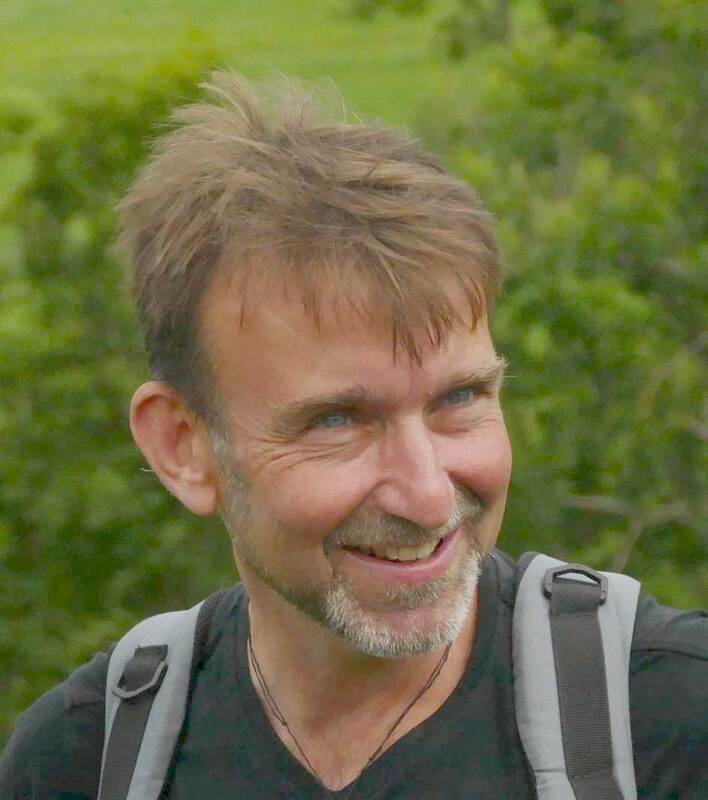 During his tenure at FGS he has acquired professional experience in Florida stratigraphy, paleontology, hydrogeology, archeology, zoology, natural history and conservation. His research interests include: stratigraphy, paleontology, karst, geoarchaeology and the hydrogeology of Florida’s numerous springs. Means coauthored a popular book entitled Roadside Geology of Florida and has published numerous articles and scientific publications on many aspects of Florida’s geology, paleontology and archaeology. Copies of the book will be available for his signing at the Science Café and afterwards in the Gillespie Museum Shop. 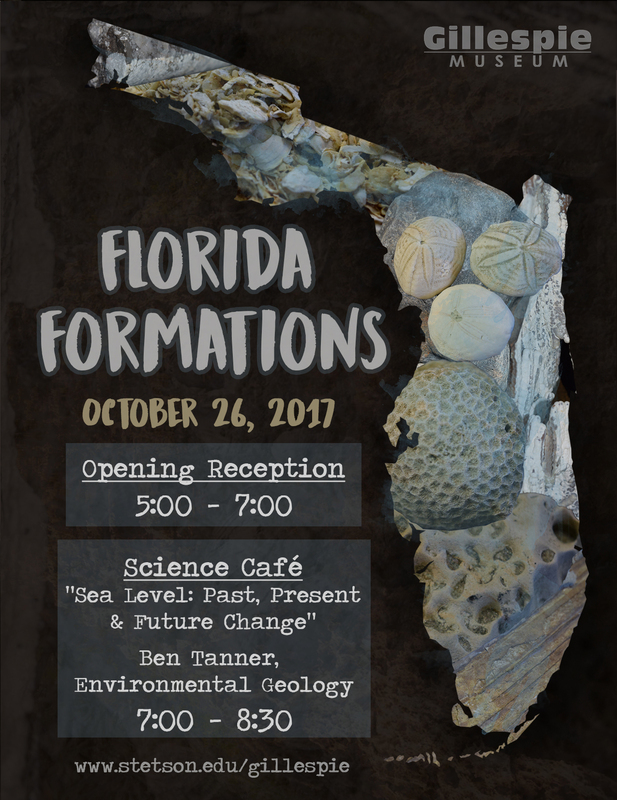 On Thursday, October 26, Stetson University’s Gillespie Museum will celebrate the opening of a new exhibit, Florida Formations: Shifting Seas and Sediments, with a reception and gallery walk, 5:00 – 7:00 pm, and a special Science Café conversation, “Sea Level: Past, Present, and Future Change,” with Ben Tanner, Ph.D., Assistant Professor of Environmental Science and Studies, 7:00 – 8:15 p.m. As part of the Gillespie Museum’s Science Café series, Professor Tanner will provide an informal presentation about sea level change through Florida’s geological history. On Tuesday, October 17, at 7:00 p.m., Stetson University’s Gillespie Museum will host visiting scholar Nury Stella Penagos for a Science Café presentation, “Our Birds Are Your Birds Too: Avian Conservation in Colombia.” This event is co-sponsored by the Partners of the Americas and Stetson’s Department of Environment Science and Studies. 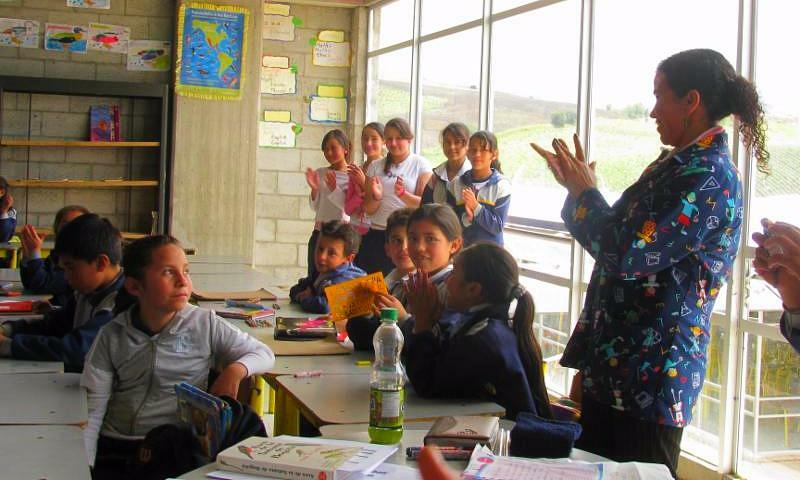 Penagos, a K-12 educator in Bogota, Colombia, has inspired children to learn about nature and their relationship to a world beyond the Andes Mountains. Her educational programming "Our Birds are Your Birds Too" links classrooms in Bogota and the U.S., enabling students to share their experiences through conversations about migratory birds found in both areas. Volusia County's own Blue Lake Elementary was a participant in the program. The program led to projects such as "A Little Bird Told Me" and "Tyguas, Guardians of the Birds in Usme." Penagos has presented insights from her work in international venues, including Morocco, Argentina, Brazil, and the U.S.
She has been an active member and leader in the international cultural exchange network, Partners for the Americas for nearly a decade: "I have greatly enjoyed training Colombian students in the appreciation and conservation of migratory bird species, sharing knowledge and experiences with their friends in the U.S."
April's Science Café topic is ideal for Earth Week because it relates to engaging our community in science and encouraging sustainable practices. The talk will provide an update on current research in the Volusia Sandhill Ecosystem, a restoration project on the museum grounds. 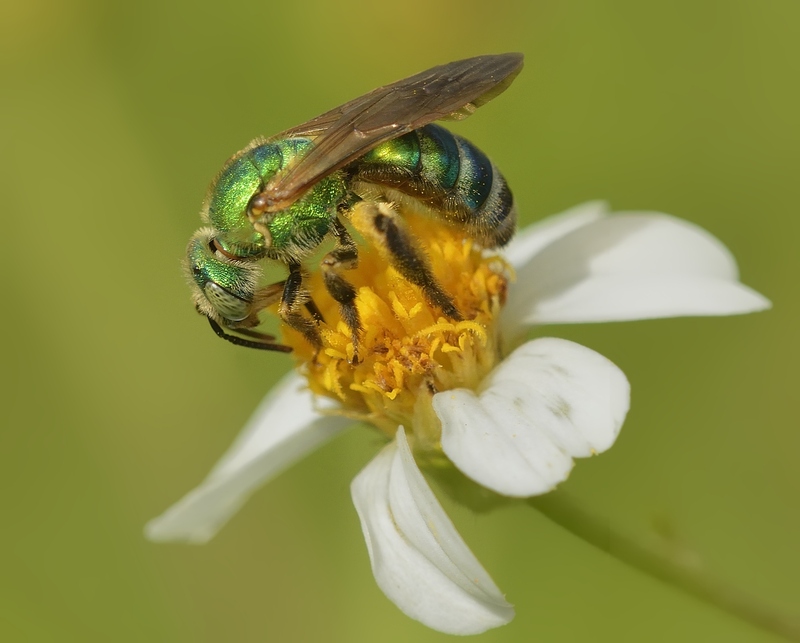 As part of a larger comparative study, Stetson biology professors Cindy Bennington and Peter May are measuring pollinator visitation rate and species composition in this campus restoration, acquiring baseline data to be built upon as the site matures. A related project—a feasibility study of citizen-generated data for pollinator monitoring—has been completed by Sarah Garcia, a senior environmental sciences major. Supported by a Stetson University research grant, in the summer of 2016 Professors Bennington and May recorded more than 1300 insect visitors to two plant species (Spanish needles, Bidens alba, and Partridge pea, Chamaecrista fasciculata). “With increasing anthropogenic impacts on native ecosystems, urban habitat fragments may become important repositories for biodiversity, especially for plants and small animals. We are investigating the way in which the Volusia Sandhill Ecosystem, a small, recently established restoration site on our campus, supports insect pollinators,” explains May. “Our results from a single season suggest that urban habitat fragments with a high density of native flowering plants, like the Volusia Sandhill, can support a diverse native bee community,” reports Bennington, “but butterfly and moth abundance may be limited by a lack of larval host plants." 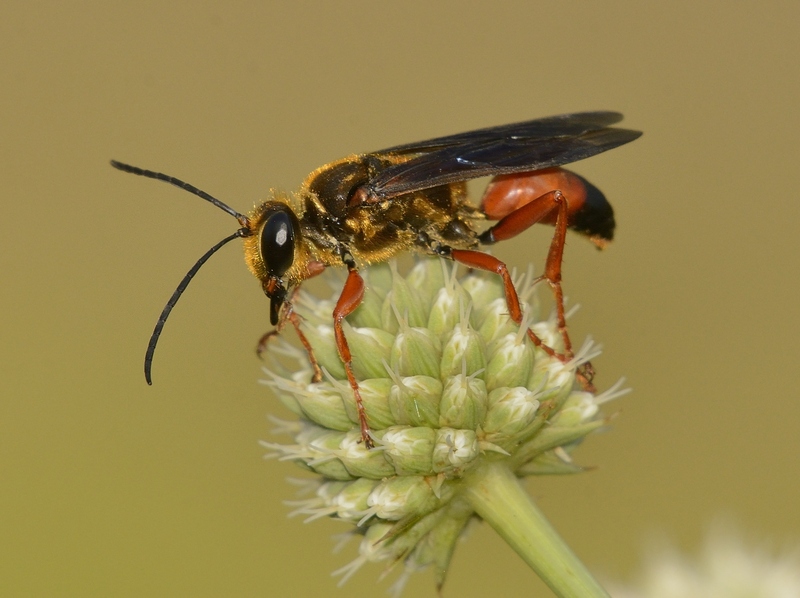 In addition to providing baseline data through this survey, the Pollinator Project seeks to enlist volunteers in collaborative field work and to educate about the importance of ecosystem restoration to native pollinators. 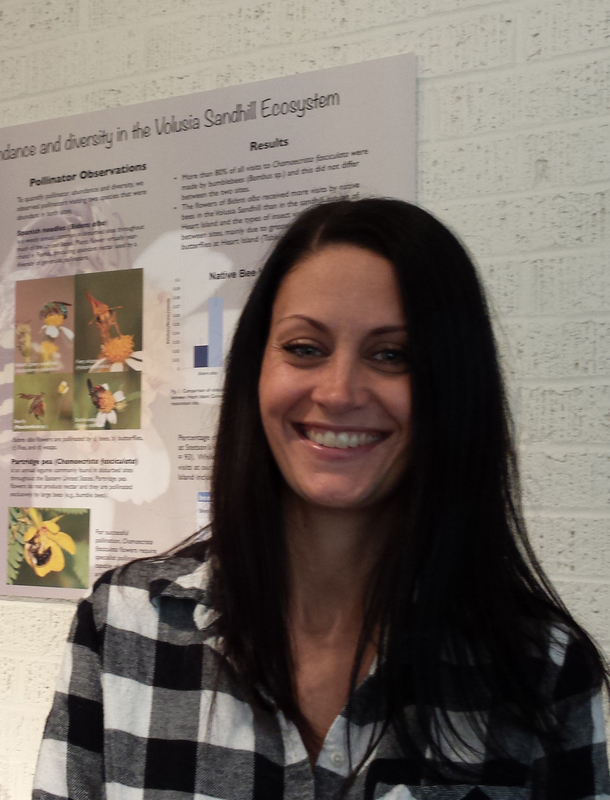 Sarah Garcia’s research has focused on what undergraduate students learn when engaged in monitoring insect pollinator activity in the site. “I feel that I've played a small role in teaching fellow students about an important topic that affects us all,” says Garcia. While enhancing the use of the Gillespie Museum as an outdoor classroom, the Pollinator Project also includes a research station with an insect collection in the Gillespie Museum's east gallery. Camille Tessitore King, Chair and Professor of Psychology, received her undergraduate (B.A) and graduate (M.A. & Ph.D.) degrees in biological psychology from the University of Virginia and completed post-doctoral positions at the University of Michigan and the University of Florida. King has published numerous articles on the effects of taste nerve degeneration and regeneration on neuronal activity and taste-related behaviors in rats as well as on the role of the taste cortex in taste behaviors. 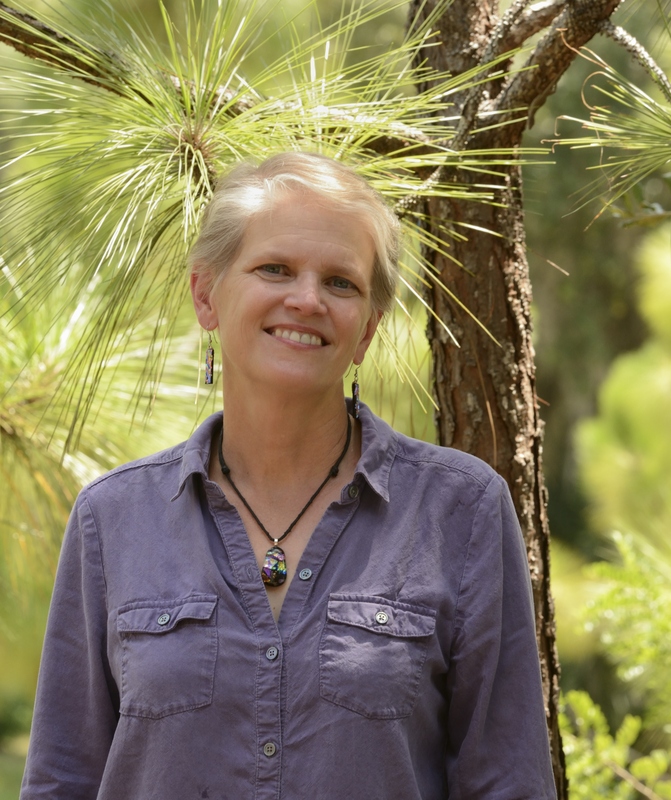 She has been a co-investigator on several grants from the National Institutes of Health and the National Science Foundation, including one with her husband, Michael King, Professor of Biology at Stetson. King has received the Hand Award for Excellence in Research; was honored for her outstanding work with undergraduates by a Faculty Advisor Research Grant from Psi Chi, (the international honor society in psychology); and has also received Stetson’s prestigious McEniry Award for Teaching. Her passion is teaching about the brain. In addition to her regular courses, she previously served as coordinator of the Betty Batson Bell Brain & Learning Lecture series and has plans to restart the series in 2017-18. She is also passionate about cooking and admits that she secretly hopes to open a small restaurant one day. In this Science Café talk, Song Gao, Associate Professor of Chemistry at Stetson, will discuss his research on the characteristics and mechanisms of pollution in the atmosphere and hydrosphere. He will illustrate, using field observations and satellite images, the atmospheric transport and chemical transformation of particulate matter in Africa, Asia, and North America. “The cross-boundary nature of environmental pollution,” explains Gao, “requires a globally coordinated approach to remediation.” His talk will also address some of the latest science-based policy advancements in mitigating climate change. 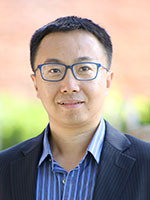 Dr. Gao joined the chemistry faculty at Stetson University in Fall 2016 after serving on the faculty at Nova Southeastern University and Hong Kong University of Science and Technology. He received his Ph.D. in Chemistry from the University of Washington and completed postdoctoral research on atmospheric chemistry at California Institute of Technology. His research and teaching interests include atmospheric chemistry mechanisms, megacity air pollution, and science-based climate mitigation. He has published dozens of peer-reviewed papers in international journals and served on several review panels at National Science Foundation. He was a co-recipient of the Alan Berman Research Publications Award from the Naval Research Laboratory. Song enjoys music (Bach and Mendelssohn, in particular), hiking and spending time with family. 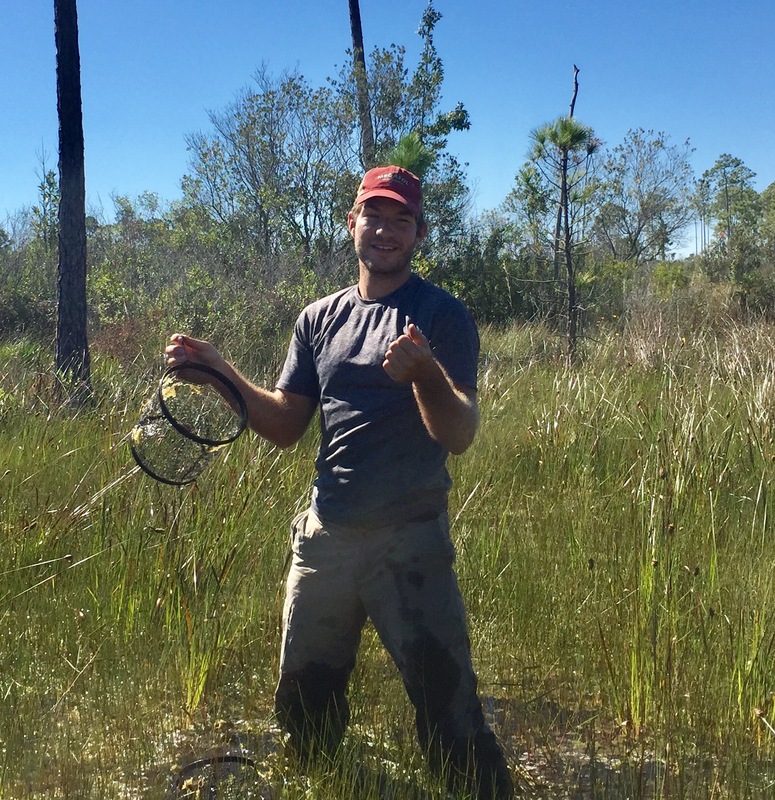 At this café, recent Stetson graduate Ethan Royal will talk about his current ecological research and reflect on a recent grad's experiences in science and his path to graduate school. Ethan has worked on a wide variety of ecological projects, both as a field tech and as a lead researcher. He is currently a visiting researcher at Archbold Biological Station, a world-renowned site and resource center dedicated to long-term ecological research. Staff, visiting investigators and students conduct research primarily focused on the organisms and environments of Lake Wales Ridge and adjacent central Florida, including population ecology and conservation biology. Royal’s current research at Archbold examines the response of fish and larval amphibian populations in seasonal wetlands to a wide range of biotic and abiotic factors, including predator presence, pond isolation, pond elevation, pond area, vegetative cover and water chemistry. 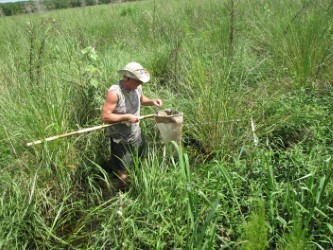 This is the first year of a multi-year pond sampling program designed to shed some light on how an abnormally wet year like this one affects fish and amphibian communities in normally temporary wetlands, and will allow for study of the effects of an invasive fish predator (Hemichromis letourneuxi, the African jewelfish) on native communities as it colonizes new wetlands. In January, Royal will begin a Ph.D. in biological sciences at the University of Arkansas, working with herpetologist J.D. Willson on a project assessing the ability of timber managed loblolly pine forests to support longleaf associated herp communities (reptiles and amphibians) in northwestern Louisiana. In his talk at the Gillespie Museum’s October 27 Science Café, Rob Mattson will discuss the hydrology, water quality and ecology of the St. Johns River system and will also discuss some of the main management issues affecting the river and steps being taken to address those. This is a community event in partnership with the City of DeLand’s Water Festival, an outdoor celebration of water and art at Earl Brown Park, on Sunday, October 16. 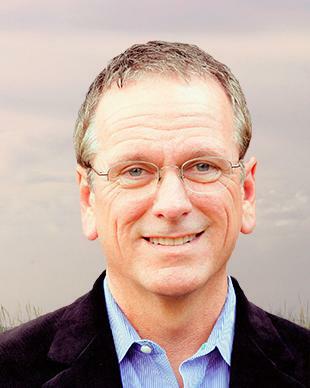 Rob Mattson is a Senior Environmental Scientist with the St. Johns River Water Management District. He has been with the District for 11 years and prior to that spent 17 years as a Biologist with the Suwannee River Water Management District. He has a B.A. in Biology and M.S. 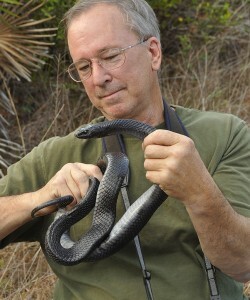 in Zoology from the University of South Florida. At SJRWMD, his work mainly focuses on investigations of the ecology of the springs of the St. Johns River and application of that science to their restoration and management. Rob is also an Adjunct Instructor at St. Johns River State College in Palatka, where he teaches the course Introduction to Environmental Science. February 7 - Cast of Fossil Hunters television series - "A Conversation with the Cast of Florida's Fossil Hunters"
March 14 - Dustin Angell, Archbold Research Station - "Florida Conservation Photography: Putting your Photography to Work""
April 25 - Ben Tanner, Environmental Science, Stetson - "Environmental Change in Florida’s Springs and Sinks: Lessons From the Muck"
September 27 - Jonathan Arthur - "Ask the State Geologist"